Click here to join our pre-oktoberfest Chicken Hunt! Oompah Music with Mirko Pressler Band ​sponsored by Oregrown! The beginning of Mirko Pressler’s life is reminiscent of The Sound of Music. Mirko started to play accordion at age two but his family had to sell his little accordion to get money to flee their beloved country of Slovenia which had become part of Yugoslavia and came under communist control. The family set out climbing over the Karavank Alps ending up in Southern Austria then making their way from Austria to the United States, eventually settling in Southern California. Soon Mirko “Mike” had another accordion and he continued his musical studies with some of the top accordion instructors in America and the world. Mirko studied continental music under the instruction of Leo Kostka, progressing to study Classical and Jazz idioms under world-renowned instructors Tito Guidotti and Tommy Gumina. Mirko’s first television performance came in 1957 on a show called Rocket to the Stars, an early version of today’s talent shows. In 1964 Mirko turned professional and started to tour worldwide from Los Angeles to Sun Valley, Canada to the Grand Canyon and beyond. Mirko has been a featured soloist and has led his own orchestra. He has played restaurants, nightclubs, ski resorts and has been the featured performer at many an Octoberfest, with a musical repertoire that includes American Standards, Musicals, Light Rock and European Folk, making Mirko a favorite of all age groups. Mirko continues to give back to the music he loves by tutoring, teaching and conducting studios as well as master classes. ​​ Don't miss seeing Mirko preform at Bend Oktoberfest! Five Bouncy Houses, Face-Painting, Princesses, and so much more! The Bend Oktoberfest Family Fun Zone is brought to you by Bouncing off the Wall and is sponsored by OnPoint Community Credit Union. The Bend Oktoberfest Hammerschlagen sponsored by Natural Edge Furniture will be on-stage at Bend Oktoberfest both Friday and Saturday nights. Hammerschlagen is a German game reportedly dating from 1940, in which several contestants try to hammer a nail into a stump. The log is set up waist high with the flat sides facing the floor and ceiling. A bright common nail (12/16d) is driven about a half inch into the wood in front of each player. Each player’s turn consists of setting the wedge-end of the hammer on the log next to their nail and taking a single swing at it. The swing must be done in a smooth up and down motion. Male players must use one hand. Female players may use both hands. Play continues to the right and lasts until one player has driven the head of their nail to (or below) the surface of the wood. The Tricycle Races sponsored by Hutch's are one of the most popular events during Bend Oktoberfest. You can sign up right before the event - so grab your friends and get ready to race you tricycles! All bikes are provided by Hutch's - all you need to bring is yourself and your sense of play. See you there! Bring your best (or worst!) voice to the Bend Oktoberfest yodeling contest. This contest is open to all ages, so make sure that you are at Bend Oktoberfest on Friday night to participate. Winner receives free swag and (of course!) bragging rights! Yodeling is a form of singing which involves repeated and rapid changes of pitch between the low-pitch chest register (or "chest voice") and the high-pitch head register or falsetto. The English word yodel is derived from the German (and originally Austro-Bavarian) word jodeln, meaning "to utter the syllable jo" (pronounced "yo" in English). This vocal technique is used in many cultures worldwide. 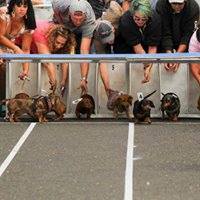 The Wiener Dog race is one of Bend Oktoberfest's most popular events. This event is sponsored by Bend Veterinary Clinic. Dr. Byron Maas and Dr. Lauren Stayer have combined experience in Veterinary Medicine that affords your pet optimal care. Our doctors are committed to quality compassionate care and treat their animal patients as if they were their own. Schedule an appointment today to see the difference in care provided by the doctors and staff at the Bend Veterinary Clinic. To sign up your dog, click here. The Chicken Dance is a classic at any Oktoberfest. Just in case you don't know how to do it, we've included a tutorial video (to your left)... but no need to study, folks, we accept all kinds of Chicken dancing at Bend Oktoberfest. Make sure to pick up your Chicken hat at the Merchandise booth before the dance to make sure you're looking your best come dance time. Also - you can enter to win lots of free swag by going on our Chicken Hat Hunt and tagging a video of yourself chicken dancing with the hats you find in #downtownbend! 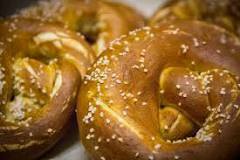 Bratwurst, pretzels, beer... oh my! We have a pretty incredible line up of Vendors this year at Bend Oktoberfest. View our vendor list by clicking here. Thank you so all our vendors for making Bend Oktoberfest a success! In the Irving Street Arena we have lots of local community acts - from the Summit High School Robotics team to the Central Oregon Aerial Arts, join us to celebrate our local community culture! ​To full the full schedule, click here. Every dollar you spend and every beer you drink at Bend Oktoberfest helps your community! 100% of the profits from Bend Oktoberfest go to the local nonprofit, the Downtown Bend Business Association. This nonprofit uses the funds to increase the vitality of Downtown Bend. To learn more about Downtown Bend, visit www.downtownbend.org.